The new Truckee Police Chief, Adam McGill is committed to improving communication with the community it serves. McGill realizes Truckee is composed of citizens and visitors who enjoy outdoor sports. A good way to connect with outdoor people is to get outside with them. McGill started the Adventure Recreation and Community (ARC) Team to interact with people while they are outside enjoying the lakes and trails. There are now 4 officers on the ARC Team that are certified in bicycle and water patrol operations. You can expect to see bike patrol officers on some of the trails and in the downtown areas. The bikes are Specialized mountain bikes, purchased with grant money from Paco’s Bike Shop. 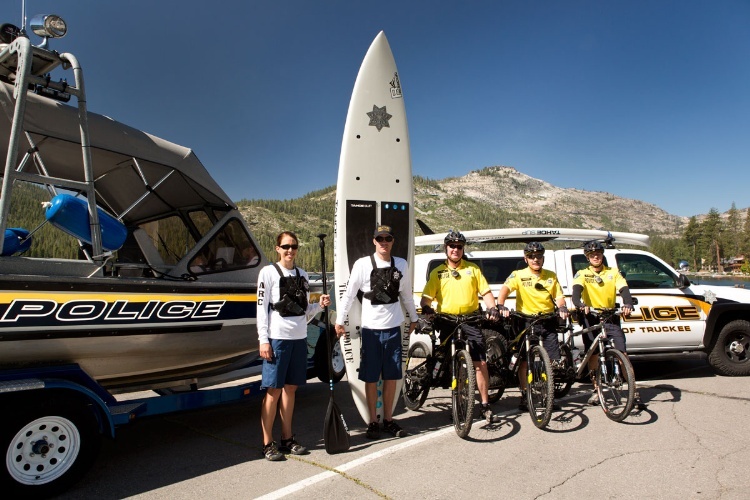 Truckee PD will still be patrolling Donner Lake, but this year they have some new patrol boats. The new “boats” are actually two new standup paddle boards. The boards and equipment were donated from Tahoe SUP. Tahoe SUP also donated SUP (Stand UP Paddle) training and rescue related skills for water emergencies. McGill hopes the paddle boards will cause positive interactions and conversations with locals and visitors. I think McGill's promotion of an adventurous lifestyle is a great idea. We will see how the ARC Team works out.